Guest speakers will be Rosemary Catacalos, Texas Poet Laureate; Gerry Frost, inter-media installation artist; and Bryce Milligan, publisher. They will each explore from their own discipline the evocative topic of symbols and how they work within our culture to move, shape and inspire us. 6 p.m. Panel discussion “Symbol in Art, Literature and Religion” with Rosemary Catacalos and Gerry Frost. Readings by Bryce Milligan and Rosemary Catacalos. This year’s Las Americas Letters event is dedicated to Brother Cletus Behlmann, S.M. (1933-2016). 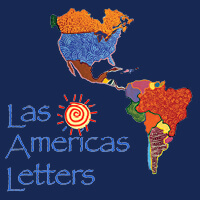 Cletus designed the logo and artwork for Las Americas Letters. We remember Cletus as a beloved Marianist brother who made life more meaningful through his vibrant, colorful works of art. The Las Americas Letters Series in Literature and the Arts is celebrating 15 years of bringing authors, artists, scholars and performers to St. Mary’s University and the San Antonio community. Its mission is to encourage empowerment through creativity and cultural understanding by bridging the Americas through the work of authors, artists, painters, musicians, scholars and educators. The series has featured a variety of artists – from Tango Argentino at the Empire Theatre to authors such as Joy Harjo, Sandra Cisneros and Gloria Anzaldua. For more information on the series, contact the Department of English and Communication Studies at 210-436-3107.